The long, cold days of winter are not the time to hibernate. You are not a bear! Winter sports such as skiing, snowboarding, skating, snowshoeing and more are perfect opportunities to pass the days outside in the fresh air. However, time spent out on the slopes or doing other activities can lead to sore and tired muscles. 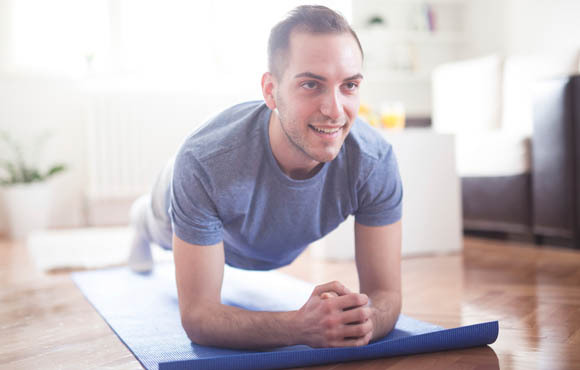 Practice these eight yoga poses before and after your winter sports sessions to prevent soreness, improve your flexibility, strengthen your muscles and increase your ability to focus. Why it's good: Builds strength in your ankles, knee and hips joints and improves balance. Why it's good: Strengthens the quadriceps and glutes. Stretches the psoas and hips. Targets all areas that winter sports use constantly. How to do it: Come to the floor on your hands and knees. Push with your hands and straighten your legs till you are in the shape of an inverted 'V'. Extend your pelvic bones up and heels down. Let your head hang freely and stretch your waist. Heels should be off the floor, but actively trying to reach the floor. Why it's good: Elongates the shoulders. Stretches and strengthens the hands, wrists, low back, hamstrings, calves, foot arches and Achilles tendon, which are all essential for any sport. How to do it: Stand with your feet together, with your big toes touching. Raise your arms above your head, perpendicular to the floor, and bring your thighs parallel to the floor as if you are sitting in a chair. Why it's good: Strengthens the ankles, thighs, calves and spine while stretching the shoulders and chest. A great pose for the tucked position in skiing. How to do it: Lie on your back, bend your knees and place your feet flat on the floor hip-width apart. You should be able to touch the backs of your heels with your hands. Place your arms on the floor alongside your body, palms down and as you inhale, lift your hips off the floor and press them to the ceiling. Keep your knees directly over your heels. Hold. Why it's good: Strengthens the back and develops the muscles that surround the spine. A powerful move for building the glutes, hips and hamstrings which are essential for skating, skiing, snowboarding and snowshoeing. How to do it: Lie on your back and extend your left leg toward the ceiling at a 90-degree angle with your right leg extended along the floor. Flex both feet. Bend your left knee and bring the knee in toward your chest using your hands. Hug it tightly against your body to relax your hip. Next, loop a strap around your left foot and slowly straighten the left leg back to 90 degrees. Press your right thigh firmly down against the floor. Why it's good: Stretches the hips, thighs, hamstrings, groin and calves and strengthens the knees. Good for all sports that involve using the major leg muscles. How to do it: Kneel on the floor and sit back on your heels. Tuck your toes under and try to be on the balls of your feet, not your toes. Reach behind you and tuck the little toes under. Hold this pose for 30 to 60 seconds. To alleviate some of the tension, you may walk your hands out in front of you so all of your weight is not on your feet. Why it's good: Stretches out all 10 toes and the fascia in your feet, which is necessary after stuffing your feet in ski boots all day and dealing with cramped feet and ankles. How to do it: Start by getting into a push-up position. Bend your elbows and rest your weight on your forearms—not on your hands. Your body should form a straight line from shoulders to ankles. Engage your core by sucking your belly button into your spine. Hold this position for 20 to 60 seconds. Why it's good: Strengthens the entire core, which includes abdominals, hips and low back—essentials for all winter sports.